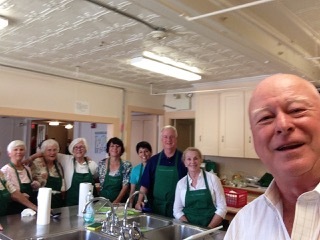 Every other month volunteers prepare and serve a meal to the hungry and sometimes homeless adults and children who gather at United Baptist Church on Spring Street in Newport. Additional volunteers are always welcome to join in the set-up, serving, and clean up. If you can’t attend you may serve by baking goodies for desert or providing fruit. Bananas are the most popular. Dates and specific instructions are announced several weeks before the evening of the dinner. On Wednesday, April 24, volunteers will gather at United Baptist Church at 30 Spring Street in Newport to prepare and serve dinner to our neighbors. The schedule is set-up at 4:00 pm, serving and fellowship with guests at 5:00 pm, and clean-up at 6:00 pm.